Graduates of a new accountancy course at the University of Ulster’s Magee campus will find themselves in demand in the battle against international fraud and other crime, according to a leading specialist in forensic accounting. More and more law enforcement agencies are utilising the expertise of forensic accountants to combat money-laundering, people trafficking and the illegal drugs trade, Professor Gerry Murray of the Ulster Business School, said at Magee today. “Trafficking in drugs and people, and fraud and financial crime costs the UK Exchequer alone £30 billion per year,” he said. Professor Murray, a chartered accountant and a well-known economic analyst and commentator, has worked extensively with Ulster Business School staff in designing a new BSc Accounting and Managerial Finance course, which has been introduced at Magee this semester. The lecture marked his appointment as a Visiting Professor at the Department of International Business at Magee. His appointment coincides with an expansion of professional and business services education at Magee as part of the University’s development plans for the campus. 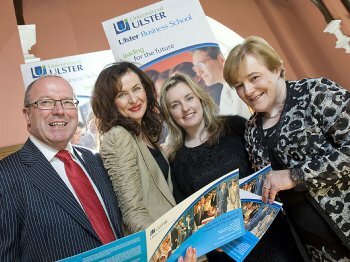 Professor Marie McHugh, Dean of the Ulster Business School, said: “We are deeply appreciative of the support that Professor Murray has provided to colleagues at Magee in developing the BSc Accounting and Managerial Finance, in particular by providing knowledge and advice in relation to professional accounting education. Professor Murray, in a lecture entitled ‘Follow the Money’, provided a detailed picture of the importance of forensic accounting in both criminal and civil legal cases, charting its emergence from 1817 in a major Canadian court case, to its current rapid development in a climate of high-profile financial scandals and imposition of regulatory initiatives. The lecture also highlighted how the hackneyed caricature role of the accountant as a staid, ledger-bound number-cruncher might soon be overtaken by new star billing as a super-sleuth adept at using computers and cyberspace to put crime barons behind bars. Professor Murray, who is from Londonderry, holds an MSc in Forensic Accounting from Sheffield-Hallam University and is an Honorary Fellow of the Centre for Investigative and Police Sciences at City University, London. A Fellow of the Institute of Chartered Accountants in Ireland and a member of the Fraud Advisory Panel, he is a partner in the Derry firm of chartered accountants, McDaid, McCullough, Moore, which he joined after graduating from Trinity College Dublin. “In essence, forensic accountants are tasked to penetrate the web of deceit, uncover reality and present their findings in a clear and coherent manner,” he told his audience of senior academics, students, accountants and leaders of the business life of the North West. “Following the money trail is important in both criminal and civil law cases. Fraud investigations increasingly call for the services of the forensic accountant. “The Federal Bureau of Investigation has twice as any forensic accountants today as it had in 1992. A few years ago, it ran an advertising campaign that featured a picture of Al Capone, with the caption’ only an accountant count catch Al Capone’. Professor Murray examined the murky world of money-laundering and the various complex subterfuges including ‘front’ businesses that criminals adopt to hide hot money, and the role of forensic accountant as an expert witness for either the prosecution or defence. Forensic accounting techniques are also becoming increasingly important in civil litigation, he explained, particularly divorce cases where, very often, solicitors acting for a wife will require a forensic statement analysis of a husband’s financial position. Professor Murray quipped that “a naturally suspicious state of mind also helps the forensic accountant” and, in conclusion, quoted a comment by the architectural critic and writer Jonathan Glancey: “The pen is mightier than the sword, but no match for the accountant”.